The five British Milers Club Grand Prix series races don’t come around too often, but when they do they create some of the best middle distance racing nationwide. These large races have slowly been growing, year on year with now more and more intentional runners taking note and travelling over to gain the full benefit and excellent racing the BMC has to offer. 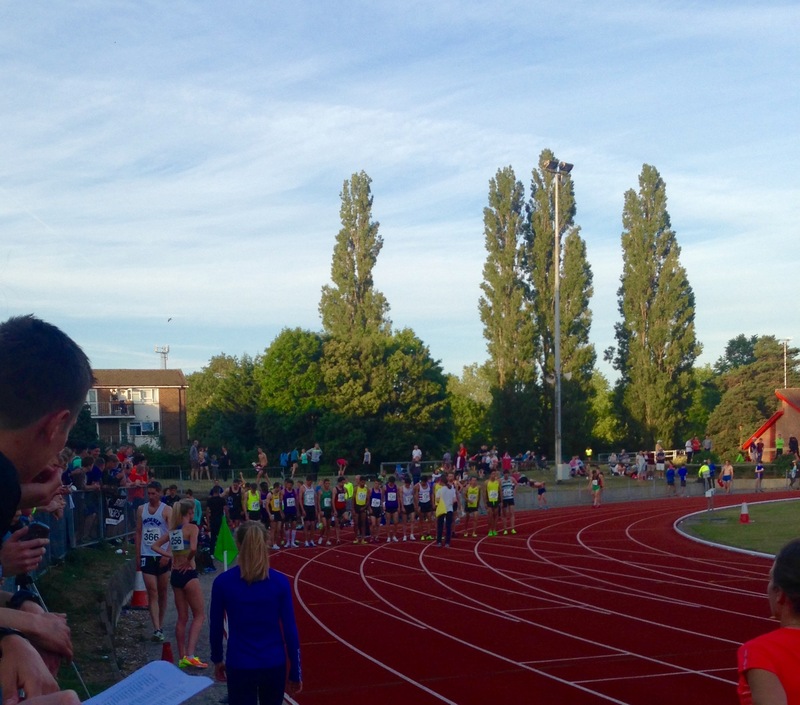 This time, held at Watford saw no change to the brilliant atmosphere we have come to expect; the conditions were perfect with a warm, calm evening creating great prospects for some fast times. These times had already been predicted by many – which I wrote about here – after the start lists were released beforehand. Multiple Olympians and World Championship representatives would make the journey to complete with the best athletes had to offer. I would make my way down to Woodside Stadium, Watford for this event to be met with an already much larger than expected crowd. On a very busy Watford Open night which is held every other Wednesday throughout the summer, you would get quite a packed back straight, but this time it was much different. You would struggle to get a spot along the railings over the back stretch with there being crowds all the way back up the hill watching and cheering in support. What added to the great atmosphere, was the presence of some of the worlds top athlete, past and present. It isn’t every athletics completion where you see Steve Cram walking up and down, watching on just as everyone else, and along with the appearances of such World Championship medalists such as Hannah England over the 800m, it really showed the great shape to which British Athletics is in. With there being so many high quality races, it is hard to find where to start. Despite this, without a doubt for me, the race of the evening would come in the men’s 1500m A race. 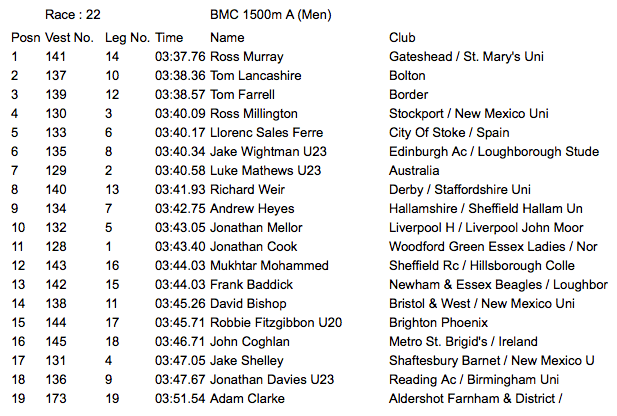 This race would be completely stacked with talent, including London 2012 Olympian and 1500m semi-finalist, Ross Murray. Others in this race would include the likes of Tom Farrell who is a 13:17 5000m runner, along with Tom Lancashire who has previously run 3:33.96, making him the fastest in the field. The pacemaker had been requested to go through 800m in 1:55 which he did so perfectly with the field already being very strung out by this point. As expected, the Nike sponsored athletes of Farrell, Murray and Jake Wightman would slot in behind the pacer with Lancashire in hot pursuit. These four would make a break from the rest of the field behind, hitting the bell in about 2:38. Murray would kick hard from the front here with Wightman and Lancashire now just behind, over the top bend Lancashire made a move to get away from Murray but it wasn’t decisive with Ross Murray finishing very strong to take the victory in 3:37.76. The atmosphere and expectation through this race would build and build with the entirely of the crowd in the stadium really getting behind the athletes to create a perfect racing aura. The high speed races would follow on into the B race also with another string pace of 1:57 at 800m being set by James McMurray of St Albans. The 3:39 man of Chris Warburton alongside Tom Cotter would break away with Cotter winning in 3:43.31. The women’s races would also come to be just as intense and exciting. There was very strong British contenders along with some foreign runners too. 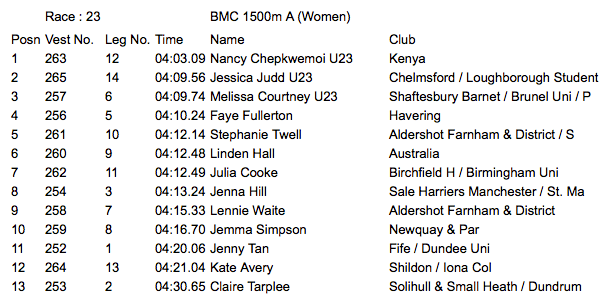 In the A 1500m race, Jessica Judd and Steph Twell would be the leading entries, but after the first 100m it was evident neither would be able to go with the Kenyan athlete Nancy Chepkwemoi. With the Kenyan athlete well away from the rest, the interesting race would come down to see who would be the best of the British. Jess Judd would certainly make her presence best known, leading the pack of Twell and Melissa Courtney (who ran away with the 1500m at the Gold Standard race). Nancy Chepkwemoi would dominate the whole race winning in an internationally respectable 4:03.09. Judd would show her class she had shown over the course of 2013 and 2014 seasons to be the first British athlete across the line in a time of 4:09.56. This would be a PB for Judd which had previously dated back to 2012, and too was the time of 4:09.74 which was run by Courtney for 3rd place, just being Judd. The men’s 800m races would struggle to live up to the very fast times which had been achieved over the other disciplines throughout the rest of the event. This may be due to lack of very strong competition such as seen in the men’s 1500m and women’s 800m, with he likes of Jamie Webb not making the start line. Despite this, there was still some very strong talent taking part and this was seen in both the A and B men’s races. In the A race, the young talent of Richard Charles would follow the race maker early on, runner from the front, showing his 1:47 capability. 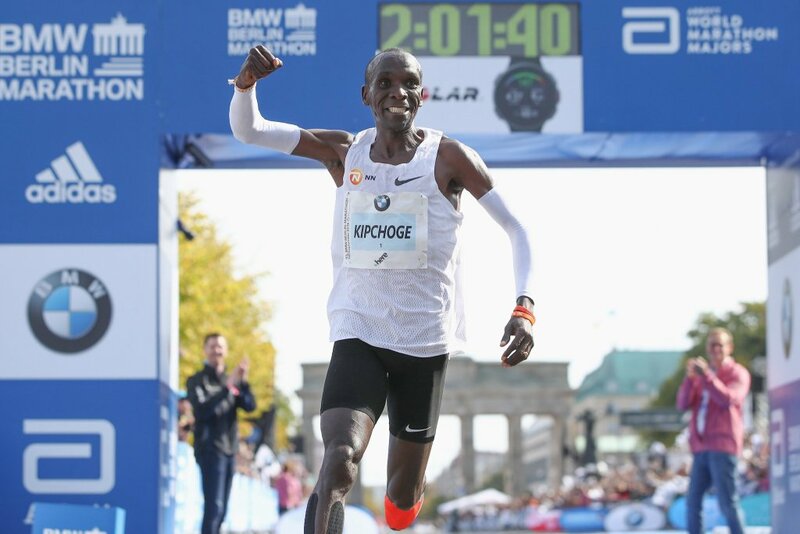 He would remain strong up until 700m into the race where others started to challenge him where he would be tripped. Subsequently, this allowed Dale Clutterbuck and Gareth Warburton to overtake and take 1st (1:49.05) and 2nd (1:49.37) position respectively. The B race would start off at a similar pace to that of the A race with Zak Curran stringing out the field in a similar fashion to that of what Charles had done. As with Charles, Curran wouldn’t be able to hold on with the old veteran of Anthony Whiteman, multiple Olympian taking to the front towards the end, taking victory in the fastest time of the day in 1:48.97. The women’s race over 800m would potentially be one of the strongest and highest status races of the day, coming in close contention with the men’s 1500m. In this race, World Championship medalist and Olympian Hannah England would line up against Laura Weightman, a London 2012 Olympic semi-finalist over 1500m. These two however are both 1500m specialists and would have their work cut out against more specific 800m runners such as the New Zealand athlete of Angie Petty who just missed out on Olympic selection last time round. Petty would show her strength and expertise over this distance as she would comfortably stretch away from the field over the last lap to take victory in 2:00.62, only just missing out on the BMC record of 2:00.37 held by Jessica Judd. The whole event at Watford was a certain success. These events are growing each year with more and more people coming out to spectate and support these top athletes. More inclusive and exciting methods have also been added to attract attention to the sport which was brilliant displayed over the longer distances in the 5000m at the end of the day. Here, the crowd were allowed into the outer lanes of the track which would create an inclosed and intense atmosphere to cheer the athletes all the way home. This was especially seen over the men’s A race with there being a very close finish between the loping style of the Polish athlete Marek Skorupa and Jonathan Thewlis. These two would battle out hard over the last 400m with Skorupa’s compatriot running alongside over the top bend in support. This may have been the defining factor with Skorupa just taking victory in 13:59.71 and Thewliss just behind in 13:59.85. It must also not go unmentioned the brilliant coverage which was given by Vinco Sport who offered great commentary nd live streaming of the entire event. All of the results of the day will be available here. The coverage of all of the races will be made available on Vinco Sport here.